Botox Cosmetic is the number one cosmetic product in the US today with millions of injection procedures performed yearly. It is a highly purified protein that has a better safety record than the common aspirin. Botox Cosmetic was originally used as a muscle relaxant for back spasms. Eventually it became common to use as a way to prevent eye twitching. When opthamologists found that using Botox in the forehead to prevent eye twitching actually smoothed away wrinkles, the modern version of Botox Cosmetic was born. Botox Cosmetic is most commonly used to relax the muscles that are cause facial wrinkles, but it is now also commonly used as a preventative measure when trying to avoid the development of these same wrinkles. A common misconception about Botox is that it paralyzes the muscles. This could not be farther from the truth. As a matter of fact, Botox works by blocking the activity that causes muscles to contract, thereby relaxing them. When facial muscles are relaxed, they do not cause the forehead and crow’s feet lines that we all find so bothersome. The patient below was injected with Botox. The patient had a very pronounced forehead line caused by excessive muscle activity in this area. 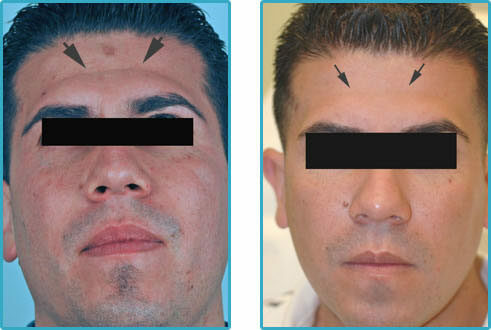 Botox injections relaxed this overactive muscle and led to a smoothing of the forehead.